Highway 40 winds through the foothills as though the engineers designed it specifically for motorcycles. It could not have had more corners if the plans had been drawn using ‘Etch-a-sketch” but my bike loved them and hills easily hugging the road as I followed an old friend and his buddy. My old friend makes a great biker as he comes from a profession that strikes fear in the hearts of many, he is a car salesmen, however a local bylaw prohibiting the wearing of colors prevented him from wearing his plaid suit. His buddy, also on the north side of 50 is not a hard-core biker but has watched Easy Rider a dozen times. His buddy chose a bike based on the largest amount of horsepower he could buy. Rather than driving a comfortable big, laid-back cruiser, you could hardly see the small crotch rocket under him and he rode it in the customary face down fetal position. The nine-thousand horsepower it produced meant he could go from 0 to 150 kilometres an hour in first gear and three seconds, a feature he did not exercise to its fullest, as he did not have enough underwear however, it still earned him the name speed. As well as owning a car dealership, my friend also owns a motorcycle shop so he when it came to accessories he had at least one of everything. He was proud of the immaculate older touring bike the shop had rebuilt to showroom condition for less than the cost of a new home. He wore new leathers and a pair of riding boots, which he kept staring at and saying we should all buy a pair at like them. One of the problems with wearing protective leather, especially chaps or pants, is once they zipped up it is impossible to bend any joints. My friend suggested the problem was further compounded by jeans, most of which were built like a cheap hotels. His dealership on the other hand sold only first class stretchy jeans. The one thing all cheap hotels have in common is … no ballroom. The stretchy jeans with spandex in the crotch, and knees, helped the joints move easier although his sons did not want to be seen in public with my friend when he was wearing them. Now all dressed up, we looked more like the three Caballeros than real bikers, and I say that meaning no disrespect to our Mexicans readers. Following my friend, I leaned into one turn after another but then noticed the highway engineer had built one more curve than my friend was prepared to negotiate… or perhaps he was still admiring his boots… either-way that is how he came to earn the nickname, Ditch. Ditch’s motorcycle left the road in style launching off the high side of the curve yet like a bull rider he managed to ride it all the way to the bottom with the style of a rag doll. The front wheel stopped abruptly when it dropped into a deep drainage cut. Ditch did not. Thankfully, the area was a combination of marsh and moss making his landing spectacular yet soft. The news flashed through the wild life population. Now whenever you come upon a deer in the area it freezes, as thought caught in the preverbal headlights not sure whether to risk staying in the middle of the road or run for the weeds where Ditch might hit it. We dug the bike out of the mud, which escaped miraculously with only a couple scrapes then took a break. That is when we decided to charter our own motorcycle gang but could not agree on a name. Ditch thought we should name it to honour the drug of choice, which he freely dispensed to each of us at every stop, but we felt it too hard to say the ibuprophen bikers movement and the initials IBM, is already feared by most. The Motrin Cycles was determined to be too commercial and we felt no one would respect the name Anacin or Aspirin Angels. Perhaps you can me a more suitable name and we will make you a charter member as well. We headed out as it began to rain, each of us toughing it out alike the rugged bikers we are. Ditch and Speed pulled on their full-face helmets, and reduced the speed on their cruise controls. Speed turned on his heated seat and handle grips to keep warm. Ditch sat back on his two-wheel couch and mumbled something about forgetting his battery operated socks and shorts as he plugged in his heated vest. I continued shivering on my twenty-five year-old bike my face hidden behind a three-dollar bandana to minimize the sting of the rain. 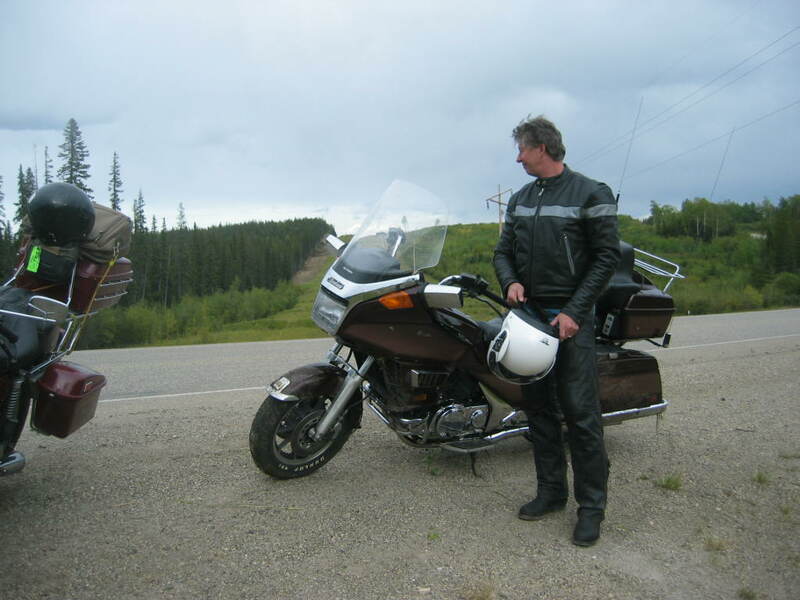 The trip continued through the spectacular Banff – Jasper parkway then along the Trans-Canada to the Okanagan. The rest of the trip was magnificent, wet but uneventful. At night, highway 40 calls me north and I imagine touring the west, cruising the curves, with Ditch and Speed. Hi there Layton – I am getting emails from layton@max-u.com. I took your advice and decided to look you up on your blog and ask you if you would still like to receive our e-newsletter, which is called “To The Point”, from the Candian Home Builders Assocation – Alberta. So, if you would like to still recieve our e-newsletter, send me quick email with your current e-address and we will ensure that you receive a copy every 2 weeks. By the way, I’ve enjoyed your humourous view as I’ve been perusing your site. I enjoyed it so much, I’ve forgotten that I’m at work!!! Back to the grind and I look forward to hearing from you….. thanks again….